I was a giant cliché when, in January, I decided that my New Year’s resolution would be to get fit. It’s something that everyone seems to aspire to at the start of a new year, am I right? Well, instead of letting my fitness goals fade into the background as February rolled around, I decided to tackle them head on and start something I thought I’d never be able to do: running. When I was younger, I was a lot fitter. I used to go swimming twice a week at try my hand at racing at occasional swimming galas. I really enjoyed being in the pool and it was a fantastic form of exercise. I still love swimming at my university’s pool and I do go occasionally, but as a gym membership here is SO expensive (I’m talking hundreds of pounds), I couldn’t really justify purchasing this on a PhD student’s wage. So, as running is absolutely free, it was a good choice. 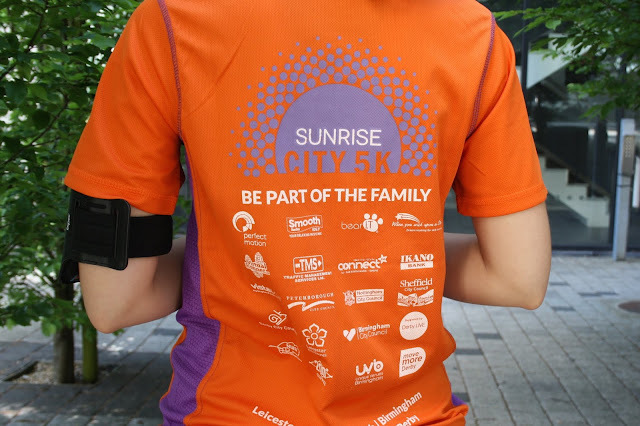 I’ve now been running consistently for the past five months and I recently completed a fundraising run, the Vista Sunrise Run, starting at 5.30am in central Leicester in aid of a local sight loss charity. I raised over £100 and ran the course in under half an hour, which I’m incredibly proud of. 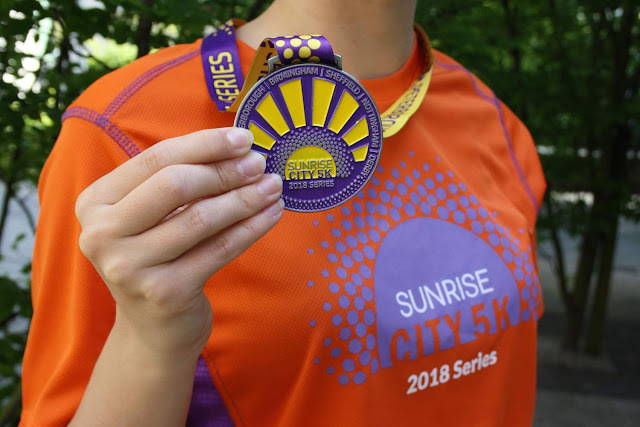 In honour of this, today I thought I would share everything I’ve learned in my short time as a runner to hopefully encourage you to give it a try as well! In last year's Summer Goals blog post, I talked about the benefits of setting a mix of small goals that are easily achievable in the near future, and bigger, more challenging goals to work towards in the long run. This healthy mix keeps me feeling motivated and ensures that I achieve more, so it was a no-brainer to apply this to running too. My long-term goal is to run a 10k race by the end of 2018, but I set myself the goal of a 5k halfway through the year, which I've now achieved! Having completed my smaller goal of the Sunrise Run, I'm now more motivated than ever to reach the 10k milestone. I am SO guilty of this and it’s something that I need to get out of the habit of doing. Not every run will be at full race pace, and that's ok! Sometimes things just don't go your way. It could start peeing down with rain halfway through your run, you could get a stitch that you just can't shake, or you could just not feel it that day and decide to go home. And that is perfectly ok! Not putting pressure on yourself is so important, even if a run doesn't go to plan you've still done the hardest part, which is putting your shoes on and getting out there! I learned this the hard way. 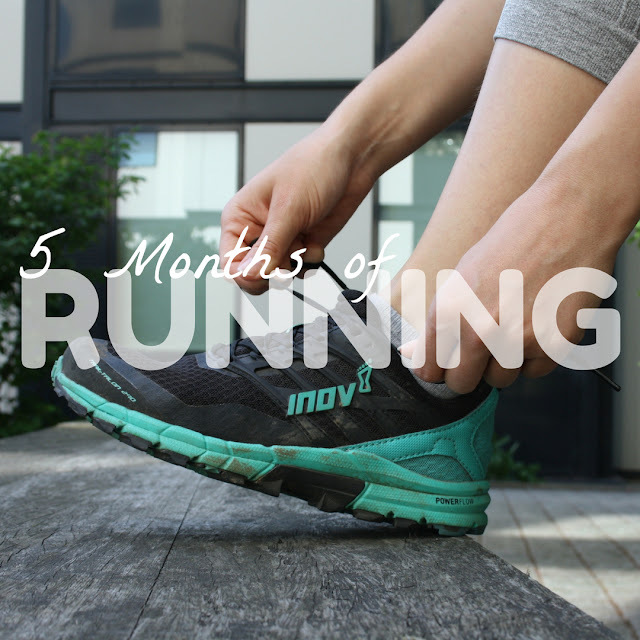 When I first started running, I used an old pair of trainers that I’d had in my closet for the past four years. They weren’t very supportive and had no spring left in them. Lo and behold, a couple of months into running when I started picking up a bit of speed, I injured my knee. Running is a high-impact sport and the pressure of the ground on my right knee proved too much. I had to take a couple of weeks off to allow it to recover. Now I’ve invested in some proper running shoes, inov-8 Womens Road Claws, which provide much better cushioning. I haven’t had an issue with my knee since purchasing them. Tracking your progress really helps you to realise just how much you improve over such a short period of time. I find it really motivating to look back over my first runs and see how far I've come. These stats also help me to set achievable goals. It's also really satisfying to come back from a long run and go "WOW, look how far I went!" 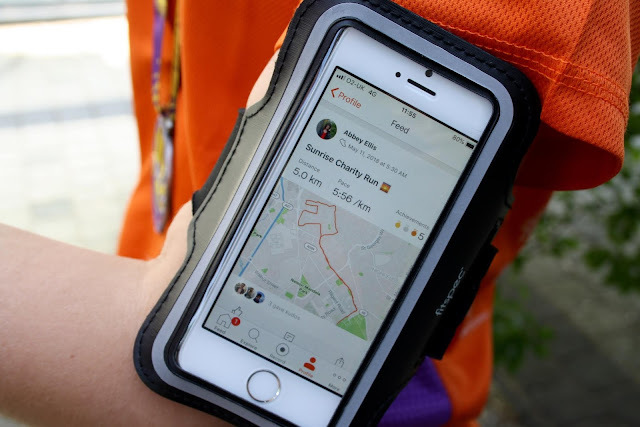 I use the free version of the app Strava and I'm a big fan of it. It shows your distance, pace, location, and even your PBs. I'd highly recommend it. When I first started running, I could barely go for 10 minutes without being totally out of puff, with a raging stitch in my side, desperately needing a drink and a chocolate biscuit. I really used to beat myself up about talking "walk breaks" during a run but now I realise that there's absolutely no shame in it. Don't push yourself to sprint every second of the way, you'll be in a much better position to go at your own pace, no matter how slow or how fast, and enjoy the process. They can offer advice and encouragement as well as giving you tricks and tips that you’d never even considered. One of the best things that I learned from my running buddy was to use your arms when running uphill. Pumping your arms really helps to keep your momentum going as you run up an incline; something that I never would’ve tried without my more experienced running buddy’s advice. Everyone starts somewhere. Even Paula Radcliffe struggled to run 5k at one point in her life, so don’t feel bad if you’re not at the head of the pack immediately. Don’t compare the beginning of your story to someone else’s middle because it will only bring you unhappiness. The only person worth comparing to is your old self. I am by no means the quickest or most skilled runner but I’m a hell of a lot better than I was just a few months ago and that’s the only comparison that I’m worried about. 8) Remember that nobody is looking at you. When you're out running at the park, it can be hard to battle those insecurities that all of the other runners and passers-by are watching you, silently judging. But I can assure you that this is definitely not the case. All the other runners in the park will be much more concerned about what they are doing than whether you're a bit red in the face or have chosen to stop and rest for a moment. And there we have it, my top tips for beginner runners based on my very short but sweet running experience. I'm really looking forward to the next chapter in my running career, bring on the 10k challenge! Do you have a favourite sport? How do you like to keep fit? Share in the comments. Give my May advertisers some love!